"This pumpkin pie recipe uses melted ice cream instead of evaporated milk. The result is delicious. I have never brought home leftovers of this pie. 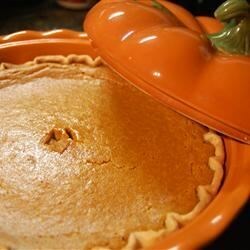 I recommend using fresh pumpkin, but canned pumpkin can also be used." THE ICE CREAM ADDED TO THIS RECIPE WAS A GREAT IDEA.. I USED FRENCH VANILLA, AND GRAM CRACKER PIE CRUST. EVEN MY MOTHER OF 82 YEARS LOVED IT, AND SHE'S BEEN MAK'N PIES FOR OVER 60 YEARS!!! !